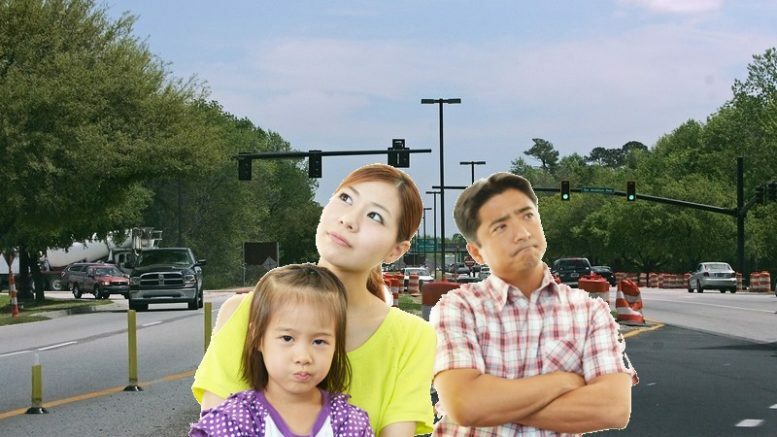 A local family seeking a cultural experience was extremely disappointed while visiting International Boulevard in North Charleston. Having just moved to the area, the Harper family was eager to see a plethora of diverse performers and shops. Instead they were treated to fast food restaurants and busy hotels. The Harper family’s afternoon began with good intentions. Pete Harper drove the minivan while Mimi Harper quizzed their children on how to say hello in various languages. When they took the International Boulevard exit off I-526, they saw a Denny’s and knew something wasn’t right. Things seemed to be improving after the entire Harper family got Chocolate Frosties from the Wendy’s drive-thru, but Pete Harper made a wrong turn and got stuck in traffic in front of Boeing for two hours during a shift change. The Harpers hope to have a better experience when they explore the wonders of Remount Road this weekend. 3 Comments on "Local Family Seeking Cultural Experience Really Disappointed By International Blvd"
Yup. Remount Road will give them a real taste of multi-culti all right. They might go home with a new pet. Asking directions to “Montaig” Avenue wasn’t very fruitful either; they were totally unaware of the Southern-Illiterati pronunciation of Montague.